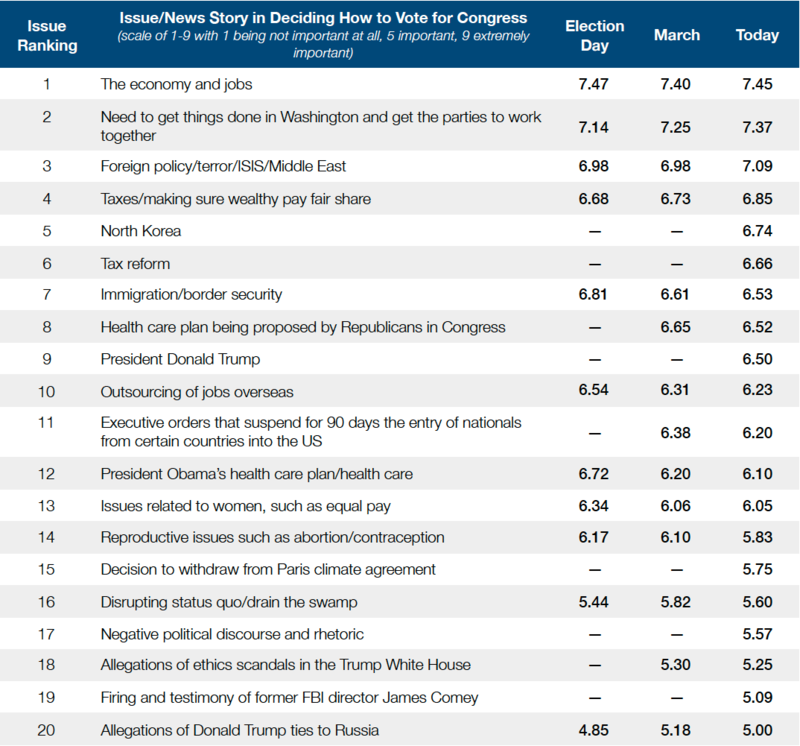 The most recent survey for Winning the Issues (November 30-December 2, 1000 registered voters) looked at perceptions and expectations of the new Congress. The survey showed that the electorate believes that there is a difference in what Democrats should do and what they will do, with Democratic voters having very different expectations of their majority compared to the rest of the electorate. Overall, the electorate believes Democrats should work with Republicans and the President to solve issues rather than oppose the President and Republicans to stop their policies (56-34), with Independents (56-24) and Republicans (81-15) taking this view. However, Democratic voters believe their majority should oppose the President and Republicans (58%) rather than work with him and Republicans to solve issues (33%). While the electorate – including Independents – hopes the incoming Democratic majority will work with the other party to solve issues, their expectation is that Democrats will do the opposite. By more than 2:1, the electorate believes that they will oppose the President and Republicans to stop their policies (62%) rather than work with them to solve issues (26%). This view about what Democrats will actually do is shared across parties. With the recent election result having been determined by majority coalition groups such as Independents and women, Democrats have to remember that their base has very different expectations of what their majority should be doing compared to the key swing groups that led to their win. These voters are looking for solutions and for both parties to work together to solve issues. If this does not happen and Democrats only focus on stopping the President and Republicans, that will be an opportunity for Republicans to regain ground among those groups in 2020. In the new survey from Winning the Issues (April 28-30), we asked voters if capitalism or socialism is the better economic system. One out of two voters (52%) said capitalism, with 17% answering socialism, but with about one-third (31%) that did not know. Among Democrats, the results were much more evenly split, with the largest group of Democrats (39%) being undecided on this question, and the remainder being split between capitalism (30%) and socialism (30%). Moderate Democrats leaned toward capitalism (33%) over socialism (23%), but the largest percentage were undecided (44%). Liberal Democrats were split among all three with a slight edge toward socialism (35%). Among those who said they voted for Hillary Clinton in 2016, there was a small lead for capitalism (36%) over socialism (28%), but with another third that did not know (36%). These results indicate that there is a significant level of debate within the Democratic Party about the merits of capitalism and socialism, and with the large percentages of undecided, there is a clear lack of consensus among Democrats about the best economic system. As part of the immediate discussions about how to deal with problems in the health care system, the future of health care and the opportunities that exist should be a key part of those discussions.